Concrete slabs are a common substrate in single-story buildings, and on the first floor of multiple-story ones. In much of the south and west, slab-on-grade construction is standard. In the north, most homes have basements and owners often want to finish them. Concrete slabs can bring their own problems to flooring installation. First, because they’re installed on the ground, unless detailed properly they can be a direct conduit for moisture. And unless you’re there to see the slab installed, there’s no way to know for sure if it’s properly detailed. And unless ex­pertly placed and finished, concrete slabs are notorious for being out of flat. Finally, installing a wood floor over a concrete slab may require building some sort of wooden subfloor assembly first. There are a number of ways to install wood floors over concrete (including direct glue-down, floating subfloors, and the screed method), but in all cases, the slab should be clean, flat, dry, and structurally sound. The concrete should be flat within 3/l6 in. over 10 ft., or Vs in. over 6 ft. 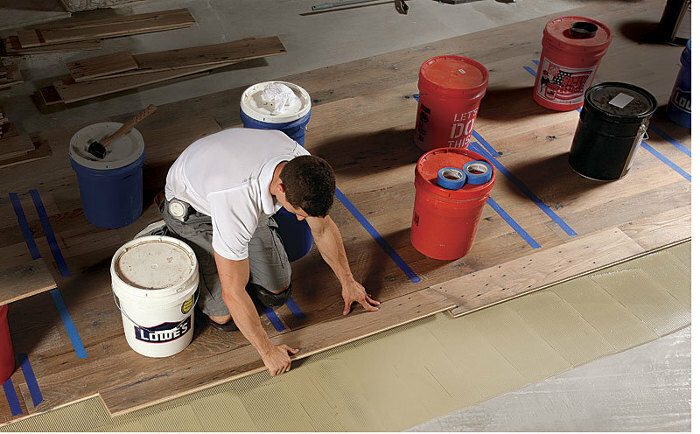 If it’s not, the remedy is to apply a self-leveling compound such as Bostik SL 150 high-compressive strength, self-leveling, cement-based underlayment to level low spots, and to grind down the high spots. Concrete slabs are like large rock sponges. They have the potential to supply large amounts of moisture that can damage wood flooring. Be sure to perform proper moisture testing (see chapter 12), although test­ing indicates only that the concrete is within the correct moisture level range at that particular time. Because of concrete’s potential to supply a tremendous amount of moisture to wood flooring, I use a vapor retarder with a lower perm rating than I do over wood subfloor. Installing a vapor retarder with a perm rating 0.13 or lower between the concrete and wood flooring is imperative to avoid future problems. There are three common ways to do this. You can use a minimum 6-mil construction-grade polyethylene film. The plastic should meet ASTM D-1745 (the information should be on the package) and have high tensile, tear, and puncture resistance. In the past, it was common to apply two layers of #15 asphalt-saturated paper, adhering both layers with an appropriate adhesive (usually asphalt mastic). Because of concerns about VOCs, this method is now rarely used. Normal sheet vinyl may also be an effective vapor retarder, but you cannot use cheap adhesive to install it (cheap adhesive generally fails when subjected to moisture). Finally, a Humidity affects the cure rate of moisture-cured adhesives to a greater degree than temperature—the higher the humidity, the faster the cure. Under normal conditions, light foot traffic is acceptable after 8 to 10 hours and normal traf­fic after 24 hours.